A new imaging technique for studying the structure of a childhood disease, respiratory syncytial virus (RSV), could provide scientists with the information they need to develop new antiviral drugs and perhaps even a vaccine to prevent severe infections. By the time they’re two years old, most children have had RSV and suffered symptoms no worse than a bad cold. But for some children, especially premature babies and those with underlying health conditions, it can lead to pneumonia and bronchitis—which can require hospitalization and have long-term consequences. The technique could clarify how RSV enters cells, how it replicates, how many genomes it inserts into its hosts—and perhaps why certain lung cells escape relatively unscathed. 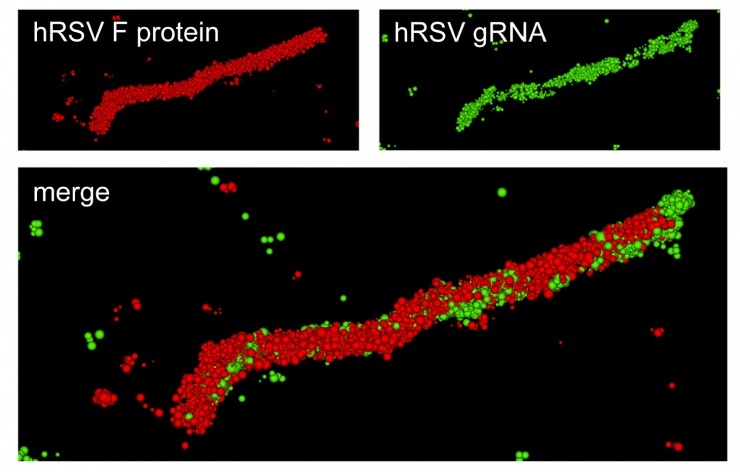 While RSV will be the first target for the work, the researchers believe the imaging technique could be used to study other RNA viruses, including influenza and Ebola. For the study, published in ACS Nano, researchers used a probe technology that quickly attaches to RNA within cells. The probe uses multiple fluorophores to indicate the presence of the viral RNA, allowing them to see where it goes in host cells—and to watch as infectious particles leave the cells to spread the infection. The research depended on a new method for labeling RNA viruses using multiply-labeled tetravalent RNA imaging probes (MTRIPS). The probes consist of a chimeric combination of DNA and RNA oligonucleotide labeled internally with fluorophores tetravelently complexed to neutravidin. The chimeric combination was used to help the probes evade cellular defenses. Work done by graduate student Eric Alonas to concentrate the virus was essential to the project, Santangelo says. The concentration had to be done without adversely affecting the infectivity of the virus, which would have impacted its ability to enter host cells. To study the infection’s progress in individual cells, the researchers faced another challenge: living cells move around, and following them complicates the research. To address that movement, the laboratory of Thomas Barker used micro-patterned fibronectin on glass to create 50-micron “islands” that contained the cells during the study. Why some, but not others? Among the mysteries that the researchers would like to tackle is why certain lung cells are severely infected—while others appear to escape ill effects. One of the challenges of studying RSV is maintaining its activity in the laboratory setting—a problem parents of young children don’t share. Researchers from Emory University and Vanderbilt University contributed to the research, which was supported by the National Institutes of Health’s National Institute of General Medical Sciences.